I know some people think all running is crazy, but I love it anyways. Still, I’ve had some pretty crazy running experiences at races over the years and thought I’d share a couple with you. 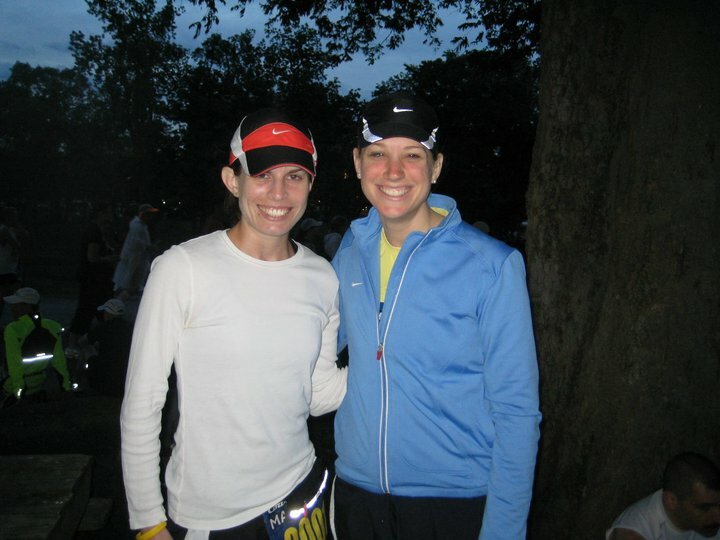 In 2010, my friend Lindsay and I flew out to Nashville for the Country Music Marathon. On race morning we took the earliest shuttle our hotel offered to the start line because we were worried about overcrowding on the later ones. Other than the volunteers we might have been the first ones there as they set things up in the darkness. As the race start drew nearer, the sun shined brightly and it looked like a perfect day for a marathon. It was cool, but not too chilly and looked to be a very calm day, although the forecasts were telling an entirely different story. In light of oncoming severe thunder storms and a possible tornado, race directors decided to start things early. While this was probably a good decision, unfortunately they did a terrible job of communicating this to the runners. While I waited in the bathroom line half an hour before the race was supposed to start I had no idea the starting gun was already going off. When I finally worked my way over to the starting line and hopped into the ninth corral I looked around and realized by the bib numbers that I was standing with the 35th corral. They were starting each group about a minute apart so that’s when I caught onto the fact that they’d started things early. I was able to push my way forward a few corrals, but I was still so far back that I was in line with many people planning to run/walk the half marathon distance. I spent the first 13 miles bobbing and weaving before I was able to get into any sort of rhythm and find some space on the course. The craziness didn’t stop there though. Turns out the forecasters were right as the sun soon disappeared behind the clouds, the sky turned very gray and eventually it opened up. Thunder and lightning rocked the course as I was pelted by rain and even hail. At mile 20, a cop with a bullhorn was announcing that the course was closing. It felt pretty surreal and I couldn’t believe this was happening. I was on pace for a nearly 30-minute PR and had no intention of stopping. I said some regrettably not so nice words as I dodged the cop and kept going. I wouldn’t get much further though. Volunteers formed a human wall at mile 21 forcing runners still on the course to divert directly to the finish line. I ran the last mile in a state of disbelief and felt so wrong crossing the finish line and taking a medal after “only” running 22 miles. Lindsay and I somehow found each other after the race and braved the weather to snag a cab back to the hotel once we learned there was a couple hour wait for the shuttles. It was a mess. In retrospect, it does make for a pretty funny story though and I do laugh every time I see my 22.2 mile marathon certificate that they sent finishers who were forced to divert early. Now I guess I can’t get frustrated when people ask me after each marathon how long this one was! I don’t think I’ll ever have a race top that one on the craziness scale (or at least I hope not), but running a small marathon in Canada last summer definitely had some quirks too. Don’t get me wrong, I absolutely loved my first small race experience – there were just more than 100 marathoners – but after all the mega marathons I’d done I was a bit taken aback when the race director called us all in for a pre-race meeting and reminded us to be on our best pedestrian behavior since the roads were still open. The fact that the race director could call all participants in and make pre-race announcements without using a megaphone or loudspeaker system was pretty amusing to me. This was nothing like the past races I’d done with 20-30,000 other runners alongside me. There was no dodging or weaving at the start line. 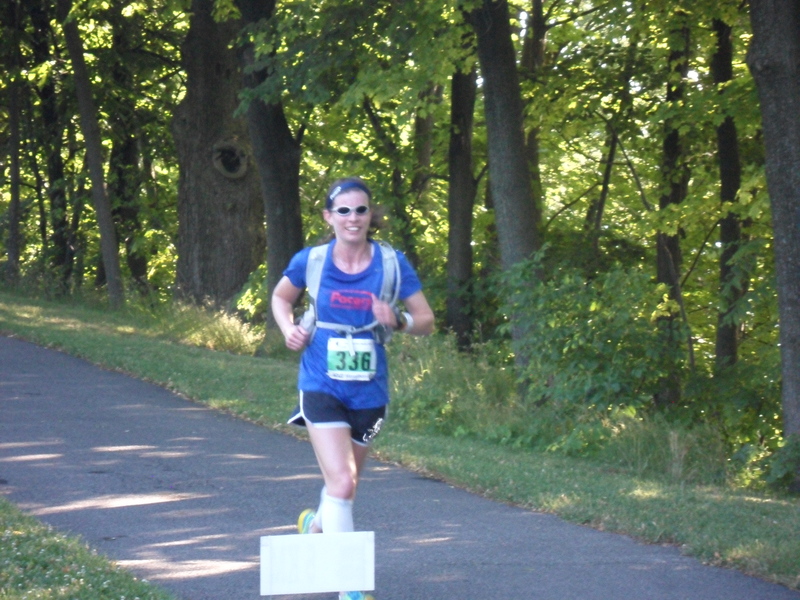 In fact I was the first woman through five miles – how’s that for crazy?! What really threw me for a loop though was that I actually did have to stop twice at different road crossings to wait for a break in the traffic. I don’t know if that’s ever even happened to me in a 5k before. I still nailed a PR though and had a blast seeing my parents and boyfriend throughout the whole course, so it was totally worth it. OK, enough about my crazy race experiences, tell me about the craziest thing that’s ever happened to you while running whether it was on the race course or just during an everyday run. This entry was posted in Fitness, Marathons, Races, Running and tagged Canada, Country Music Marathon, marathons, Niagara Marathon, running, storms by Colleen Lerro. Bookmark the permalink. Well, in addition to the our fun time in Nashville, I had quite the “only in DC’ experience when during the Marine Corps 10k this past year they stopped the race about 4 miles in due to a suspicious package. We waited around for about 3-4 mins before they let us continue. Unfortunately nothing was done for our times, but I still consider it an unofficial PR even though my official race time has me running it at about marathon pace.